Actually, it was only a day, okay, a half-hour or so at the nursing home. But returning to Country Villa Sheraton even for that long unleashed a flood of memories. I climbed up the steps that I had once struggled to walk past on my first outside walk and entered the lobby. As I waited for the receptionist to get off the phone, I sat down and watched the open therapy room door. I didn't see any familiar faces, and I worried that I had waited too long for this trek. 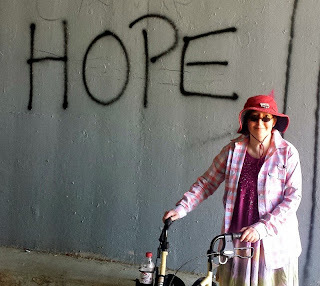 I had returned to the nursing home to try to record the names of the people who had most prominently figured into my recovery, excluding the ones I still remembered. But I'm terrible with names, and at the time when I would've still remembered them, when I first got back home, I was too busy struggling to get up from the couch and walk to the bathroom to think about a future memoir. Indeed, it wasn't until I could ease up somewhat on my grueling physical therapy exercises that I was able to begin devoting some of my time and energy into writing about my experiences. The receptionist told me to go wherever I needed to ask questions, so I walked past the area where I had taken my first short indoor walk toward the receptionist's desk and entered the so-called gym. I again saw no one I remembered until I passed the door and looked over to the end of a long table against the side wall. Yes! Apparently, there had recently been a large turnover, but at least Karen was still there. She remembered many of the names I sought, one of which was in fact hers. She showed me the collage of my walking pictures that we had included with the gift basket of food Keith and I had delivered on Christmas Eve in 2013. 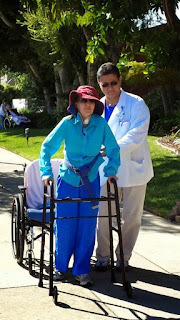 It showed my progress from coma to nursing home to our early rehab walks. Someone had posted it inside an open cupboard. I said that I hoped it provided inspiration to some of the patients. Karen said she had just been looking at the collage. After I had gotten most of the names I needed and thanked Karen, I headed out to see if I could find any nurses I remembered, as well. But I returned soon after when I realized I wanted to know the name of a certain Alzheimer's patient I had often seen in the gym. Karen couldn't remember her, but I said that was okay because I had already referred to her one of my essays ("Voiceless") without using her name, and I could do the same in my memoir. This sweet woman was particularly memorable because of the small baby dolls she doted on as if they were real. Angel--thank you for that name, Karen!--had given the woman her first doll because he thought it would help her to feel more engaged. It was more successful than he had even imagined. 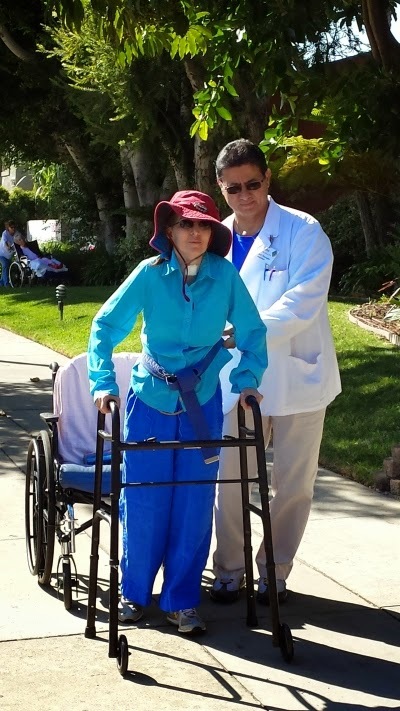 He and Arin--again, thanks!--would incorporate "her babies" into her physical therapy sessions, tying them to her walker and treating them like they were real. [Well, okay, if they had been real babies, tying them to a moving walker with stretchy exercise bands would've been frowned upon.] I've often wondered about her since then. I always thought she must have been a very kind and nurturing woman before Alzheimer's began stealing away her mind. I never did find a nurse I remembered, though Joella, who was sitting in the waiting room, had. But I did see that woman with Alzheimer's. For the first time, I saw her without a doll in her hands to stroke. The tender, happy expression had drained from her face. She muttered something business-sounding about forms to herself as I passed. I didn't ask her what her name was because I wasn't sure if she even remembered it. Even worse, that could've upset her badly. I couldn't help wondering if the loss of Angel--who had moved on from the nursing home--and the dolls he gave her had contributed to that marked change in her demeanor. From an overheard conversation between Angel and Arin, I know that she had a son who was concerned about her treatment by the physical therapists. He thought they didn't treat her sensitively enough. On the contrary, I saw nothing but nurturing and kindness from the assistant physical therapists regarding her care. So, while she clearly has a loving son, but he's not able to be with her as much as the therapists are. Though of course Alzheimer's is a degenerative disease, I can't help wondering if the loss of those dolls and the dedicated physical therapists who had encouraged her might have had a detrimental effect. They're relatively low paid, and you can't blame them for moving on. But it still makes me feel like buying some baby dolls and giving them to her...assuming it's not too late. But, really, no one can do anything for her now. I chose this pic for my Skeptical Inquirer bio because I look, um, skeptical in it. When I submitted my new essay, "Sympathy for the Devil-Believers," to Free Inquiry, it was a bit of an act of faith, so to speak. Though it's something of a sequel to the first essay they accepted, "Without a Prayer of a Chance," it might have been too soon for them to want to publish another essay written by me. But I decided to take a chance...and it payed off. In fact, to be honest, I actually expected them to accept it. This is a new experience for me, coming from the fiction-writing world, with its constant stream of form rejections. I lived for the encouraging rejections. Sounds like an oxymoron, doesn't it? But I don't think this is really an indication of my nonfiction writing brilliance. Though I do think my nonfiction benefits from my ability with fictional prose, I believe my success with the skeptic/humanist market--three for three!--has more to do with my understanding of secularists. I understand them because I'm one of them. As a fiction writer, not a journalist, I tend to write for myself. In this case, I'm in tune with the interest of this market because I'm not targeting it from the outside. I have sympathy for the non-believers, because I am one. The lesson I take from this is that I need to continue writing for the skeptic and humanist market. Four for four, anyone? Tooling around the Owen Lab's website, I learned that Dr. Adrian Owen and his colleagues at the Brain and Mind Institute have developed a portable device that allows communication with people suffering from complete locked-in syndrome. Here's the NewScientist story: Portable mind-reader gives voice to locked-in people. I didn't suffer from locked-in syndrome, but I think Kate Bainbridge did at one point. She refers to being aware, yet unable to communicate. I, on the other hand, was only semi-conscious. That's why stimuli from around me only leaked into my coma-dream, as I call my near-death experience. Still, this is an exciting advance. The Owen Lab is also working on ways to detect covert cognition with EEGs. I received an EEG, though all it could detect was that I wasn't brain dead. You may have surmised this by the fact that I'm writing this. At any rate, I wish them luck in their further endeavors as they seek to help people like Kate Bainbridge and me. 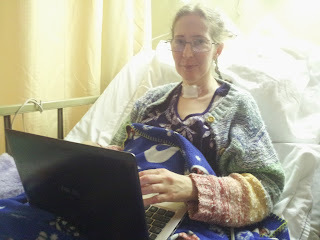 My room in Skilled Nursing, where I was immediately whisked after my trach was removed, was freezing! Note how thin my hair had already gotten. This photo was soon before I left the nursing home. Google's new photo-storing service employs facial recognition algorithms to lump photos of people together automatically. It's a work in progress. Indeed, like something out of science fiction, it thinks I'm three people. The first Stephanie consists of my BC photos (Before Coma). The second Stephanie is comprised of my coma and nursing home pics. 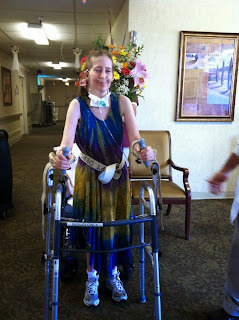 The final me is the current one; all of those pictures were taken after I came back from the nursing home. Now, you might think that it's only gauging this based on my hair, since it went from long to braided to short. But perhaps Google Photos is onto something deeper. At Donnafugata Castle in Sicily, two individuals with full manes. 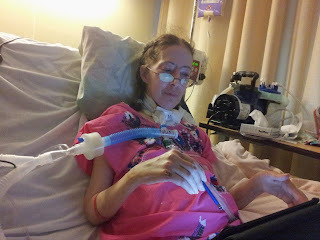 Stephanie One had only recently been diagnosed with dermatomyositis. Though her shoulders were still weak from the DM proximal muscle damage, she was reluctant to cut her long, thick, curly hair short, even though it was so hard to wash and style, because it looked really nice and she got many compliments on it. 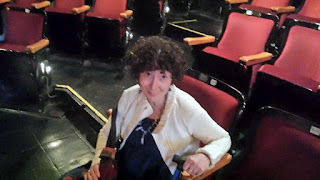 Though the muscle damage in her hips, buttocks, and legs had improved considerably, she was pleased that her dermatologist put her on a significantly increased dose of prednisone, since the higher dose was clearly making her stronger, and she was afraid that she was still too weak to walk through the ruins of Sicily that beckoned to her. Even so, when Keith and Stephanie arrived in Sicily, her legs kept collapsing as she attempted to board the steep steps on tourist buses and the Mt. Etna funicular. She had also lost so much weight during her illness that she needed the prednisone to help her regain the weight she had lost from her already skinny frame. She had a license to make Sicily an all-you-can-eat buffet! But the strong prednisone dose weakened Stephanie One's immune system so seriously that she caught Legionnaires' disease and listeria while in Sicily. The gastro-intestinal symptoms of the listeriosis presented themselves immediately and are best left to the imagination. But the Legionnaires' disease triggered a severe case of sepsis, which dropped her blood pressure so low that she experience a series of strokes on both sides of her brain, causing her to fall into a six-week coma. Thus, she morphed into Stephanie 2.0, who came about as close to dying as you can get without actually "passing over," as believers like to say. She lost further weight on the liquid diet being pumped into her system. When she awoke, it was many weeks before she was allowed to eat solid food again. Her tangle-prone hair was repeatedly braided and rebraided during this period to keep it looking neat. Brushing is out of the question when you can barely use your arms or even lift your head. When Stephanie Clone Three got home from the nursing home, she was forced to cut her now-scraggly hair short because she had lost so much of it while she was still Stephanie, the Sequel, due to all the detangling and rebraiding, plus weakened hair from the respiratory distress suffered during the coma. Keith put her on a high-calorie diet because she was starting to look like a Holocaust victim. That worked all too well, as the notorious weight-gain side-effect of prednisone finally kicked in. Her normally thin, angular face rounded and her stomach began protruding--yet more prednisone side effects, aided by the weight gain. But her hair regained its naturally unnatural thickness. During this time, her nonfiction writing about her recovery began to be accepted by major publications. Who will Stephanie Mark Four be? Well, the difference may be too subtle for Google Photos to detect, but finally free of the curse of prednisone, her weight edges ever downward as her face continues to shed the round "moon face" caused by the corticosteroid. Ditto her "pregnant belly," which birthed no joy. But those had already shrunk considerably, anyway. Stephanie Three is finally starting to resemble Stephanie Prime--the "normal" one, relatively speaking, before even the DM. Writing responses to my FOTMD friends in the nursing home. There were countless typos in my posts because it was so hard for me to hold the stylus at first. When you are a pet owner, you know that they will inevitably break your heart by dying. You will always feel a pang of loss when you think of them, and it never gets any easier, no matter how many pets you lose. But that doesn't stop you from getting a new pet to fill that missing place in your heart. You know that the love you will give and the affection you will receive far outweighs the unavoidable pain at the end. It's okay; that was just a metaphor for life. This is not a sappy homage to a lost pet, so put down that Kleenex! Living means learning to accept loss. Love affairs end; parents die. Some people crumble, but most soldier on. I've talked about how my resilience has aided in my recovery before. It has helped to deal with my lost abilities and the periodic setbacks along the way. My first loss was of course my ability to walk. I guess that one wasn't hard to accept because I didn't have much choice in the matter. Feeling sorry for myself wouldn't have helped me to walk, obviously, so all I could do was try as hard as I could in my physical therapy. I had been suffering from loss of equilibrium since I awoke from the coma. Since I couldn't walk, it was most apparent in the tilt-a-while sensation I felt when I was turned over in bed to prevent bedsores. When I finally started walking, it felt like mal debarquement syndrome--a extended bout of vertigo triggered by boat or plane travel--which I had been experiencing in Sicily, probably triggered by the twisty-turny roads when we stayed on Mt. Etna. My past bouts of mal debarquement had lasted months, so I wasn't that concerned about it. But after I got out of the nursing home and was able to see a neurologist, she told me that my vertigo was actually caused by stroke damage. This was a kind of second loss, since I had previously thought that I hadn't suffered any damage from the strokes. Though my vertigo has improved--from healing and also balance exercises--I still suffer from lack of balance. My neurologist thinks it will eventually go away completely, however. My next loss came as I was preparing to return home on a furlough to work out any kinks in coping with my extremely limited mobility. Keith was forced to tell me that my cat Klaatu had died a few months before. Sorry, I did say this wasn't going to be about dead pets, but this is only a few paragraphs, and I promise it won't be sappy! He hadn't told me because I had enough to deal with trying to relearn how to walk or even sit unsupported. Klaatu died suddenly, perhaps of a heart attack, so at least she didn't suffer. She always had an intense case of separation anxiety, so I had been eager to get back home to reassure her that I hadn't abandoned her, after leaving her for a full month on our trip to Sicily. Now she would never know. I couldn't stop crying about it. Sniff. Where is that Kleenex? Sorry again--I swear that's the last time! Of course, I knew that she wouldn't have understood that I couldn't help leaving home again after only a few days, but at least I would've been there for her once more. Keith told me that I paid a lot of attention to her in those few days home. I can't remember that time well because I became mentally altered as I developed sepsis. 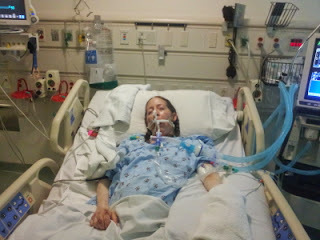 It was the sepsis that caused the strokes which led to my six-week coma. Next came the hair loss due to the acute respiratory distress syndrome I suffered during the coma, along with the continual braiding and rebraided in the nursing home. I previous chronicled this sad tale in this blog. Though my hair is still fairly short, it's now back to its unnaturally thick glory. I decided not to grow it long again because I like not having to spend hours futzing with it to keep my hair from looking like a fright wig. My most recent loss happened when the owner of Friends of the Mountain Dulcimer banned me from the website. FOTMD was the place where my friends had been lending me their support and prayers throughout my recovery. The whole story of why she banned me would take too long to go into here. This is the Reader's Digest version: Strumelia, as the owner calls herself, was at one point one of the people offering me support. Perhaps she eventually got tired of the length of my recovery. Apparently, she began to feel that I was trying to hijack threads to talk about my illness, as if that would even be a goal for me. This stemmed from a conversation that started with a friend referring to her rheumatoid arthritis in a video meant to raise awareness of lupus. I mentioned my own autoimmune disease. Though my coma and other related subjects were discussed, the conversation also drifted into depression and other hidden illness. Strumelia forbade from discussing my illnesses at all after that, which I found offensive. This is who I am now. Would she have banned me from mentioning that I'm Jewish? I said at the time that the whole kerfluffle stemmed from a colossal series of misunderstandings. I thought things were simmering down before she suddenly banned me. I posted about this in a couple of dulcimer groups on Facebook, since that was the most efficient way to inform my Facebook dulcimer friends. I spent the rest of the day fielding IMs. I was flooded with support, not only from my friends, but many strangers, as well. This helped tremendously in dealing with my sense of loss. It felt like a death when Strumelia banned me. What's more, all my emails pertaining to my coma and the early days of my dermatomyositis vanished when she chose the nuclear option. I needed them for my memoir. An era of my life has not only passed, it was obliterated. Fortunately, I still have the memories, as well as the two threads where I received all that wonderfully kind support, which I had previously copied. I will soon be posting the first thread in this blog, which among other things chronicled my first steps in the nursing home. The threads were the precursor to this blog. As in all my other losses, I will survive this, too. Just like a beloved pet, FOTMD has left a hole in my heart, but I will always love my FOTMD friends.